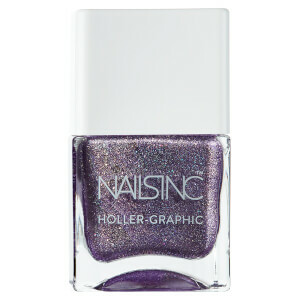 Take your nails to outer space with the nails inc. Holler Graphic Nail Polish in Cosmic Queen. The mint green shade sparkles with particles of holographic glitter for an iridescent rainbow effect, while the brand’s signature long wear system and wide hugging brush ensure the nail varnish gives full coverage that sticks around without chipping or flaking. Expect an eye-catching manicure that’s out of this world.